Sandwiched between the winter chill and the summer crowds, Paris in springtime bursts with new life across its parks and gardens, street markets and café terraces. 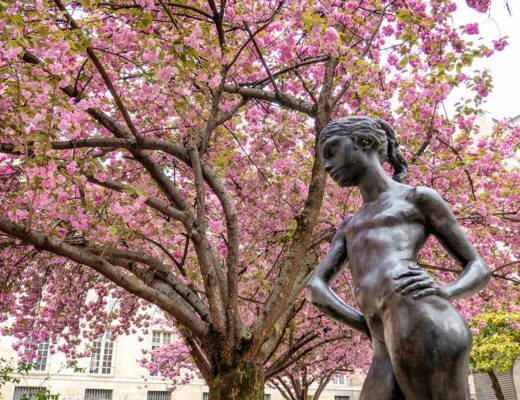 Add a sprinkle of pretty pastel blossoms, lush green parks, a dash of romance, chocolate-fuelled Easter celebrations and a string of special cultural events and you’ve got a season that’s packed with Parisian pleasures. But what are the essential experiences you shouldn’t miss if you’re visiting Paris in the spring? 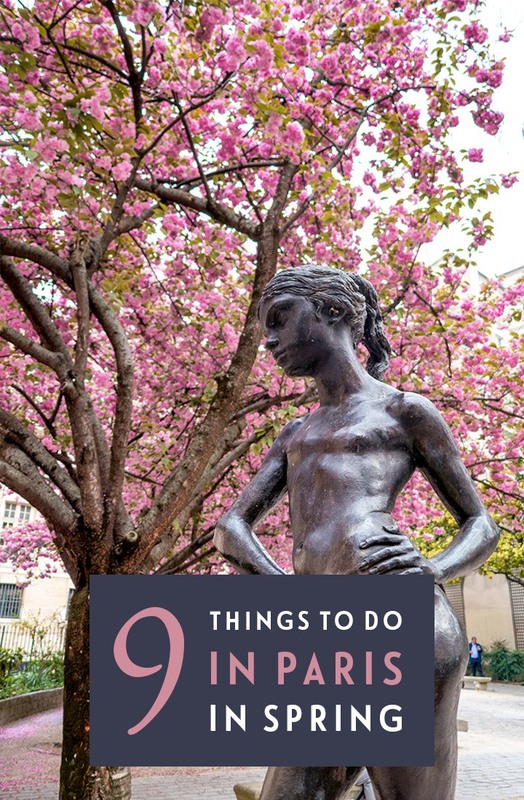 Here are nine of my favourite things to do in Paris in springtime. What’s Paris’ spring weather like? The weather in Paris in the spring is starting to warm up. Temperatures rise from an average high of 12°C (54°F) in March to 20°C (68°F) in May. 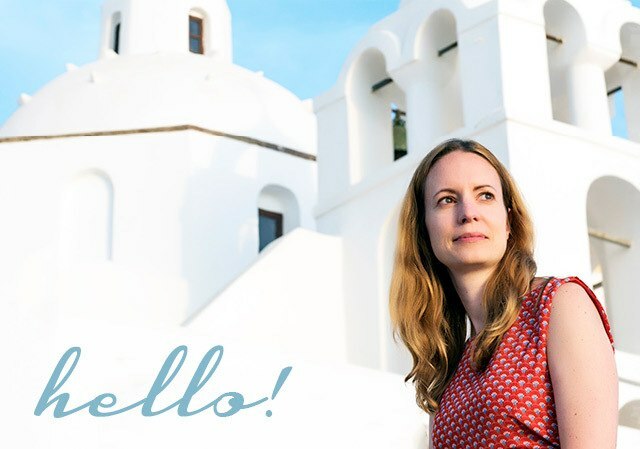 It’s a great time to explore the city before it gets too hot. You might need some warm layers for evenings though – especially if you’re visiting early in the season – as well as an umbrella as there are around 12 days’ rainfall a month. From trees draped in blossom to immaculately manicured gardens planted with rows of tulips, Paris’ spring blooms add a sprinkle of colour to the city. 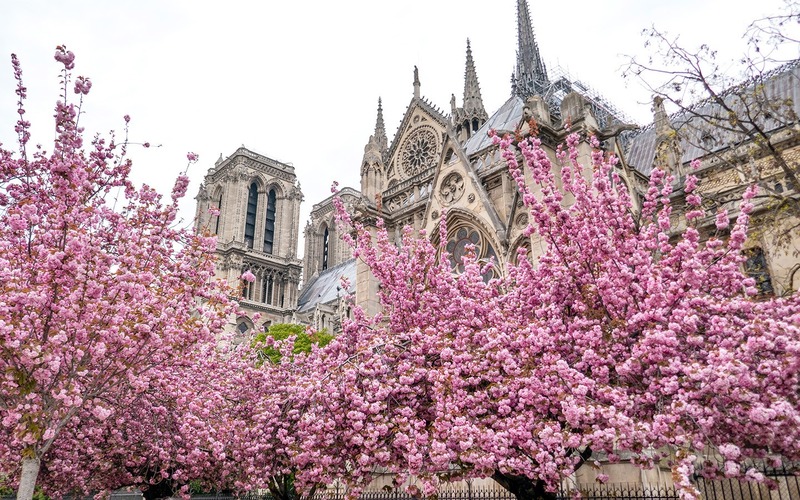 The pale pink cherry blossoms are a photographers’ favourite, and you’ll find crowds gathering in the most popular spots, like the Trocadero Gardens, around the Eiffel Tower and in Square Jean XXIII by Notre Dame Cathedral. Or if you go a bit further afield there’s a whole cherry orchard at the Parc de Sceaux. The cherry trees usually flower in April, though when exactly depends on the weather. But even if you miss them there are magnolia and wisteria blooms too, as well as floral displays at the city’s parks. 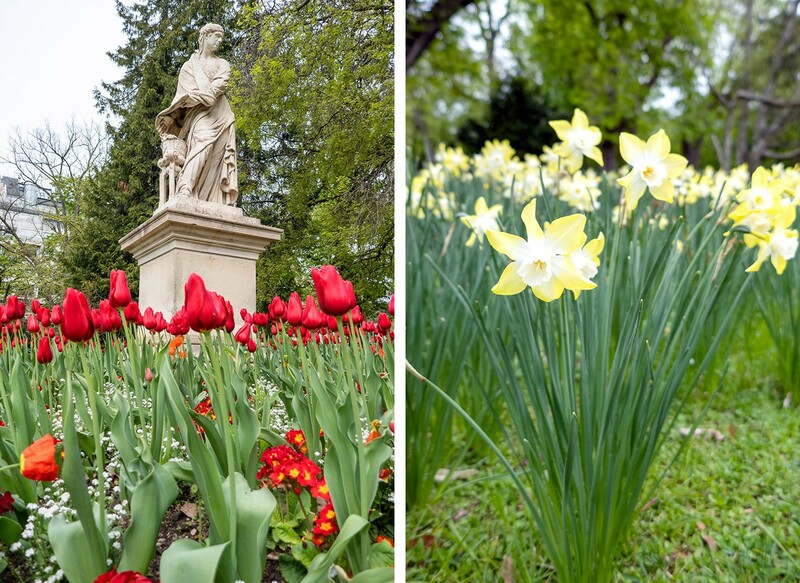 Every park is splashed with colour from tulips, daffodils and peonies, but some of my favourite spots are the Luxembourg Gardens and Jardin des Plantes. Or head to the Marché aux Fleurs on the Île de la Cité to buy yourself a bouquet of flowers at the daily market. Celebrate Easter at some of Paris’ most famous churches and chapels. 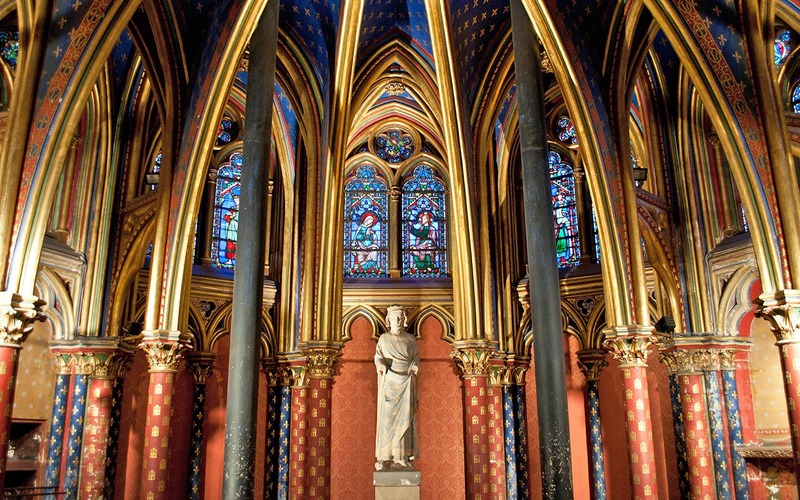 At stunning Gothic Saint-Chapelle you can listen to a concert of music from Vivaldi, Bach and Purcell against the backdrop of the chapel’s 600-square-metre stained glass windows. There are also special Easter concerts at La Madeleine Church and the Palace of Versailles. 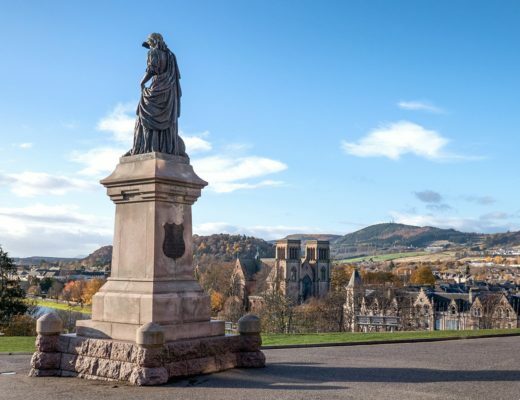 Or you can join a church service on Easter Sunday – there are English-language services at Paris’ American Cathedral, American Church, Trinity International Church, St Joseph’s Catholic Church and The Scots Kirk. Easter’s also the perfect excuse to feast on chocolate, and the edible works of art from Paris’ top chocolatiers are almost too beautiful to eat – but not quite. They’re worth visiting for their window displays alone, with ornately decorated eggs and chocolate sculptures. Look for Jeff de Bruges and La Maison du Chocolat shops, or visit Galeries Lafayette department store. But if you’re a real chocolate lover, then head to Saint-Germain-des-Prés. This is where you’ll find high-end chocolatiers Jean-Charles Rochoux (Rue d’Assas), Chocolats Richart and Patrick Roger (both Boulevard Saint-Germain) – as well as Pierre Hermé, who creates delicious chocolate creations as well as his signature pastel-coloured macarons (Rue Bonaparte). 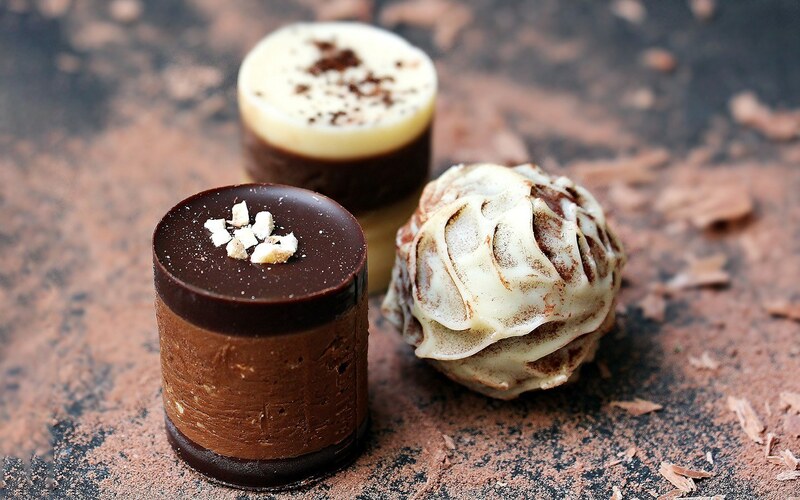 You can even take a chocolate and cake-themed walking tour through the neighbourhood. 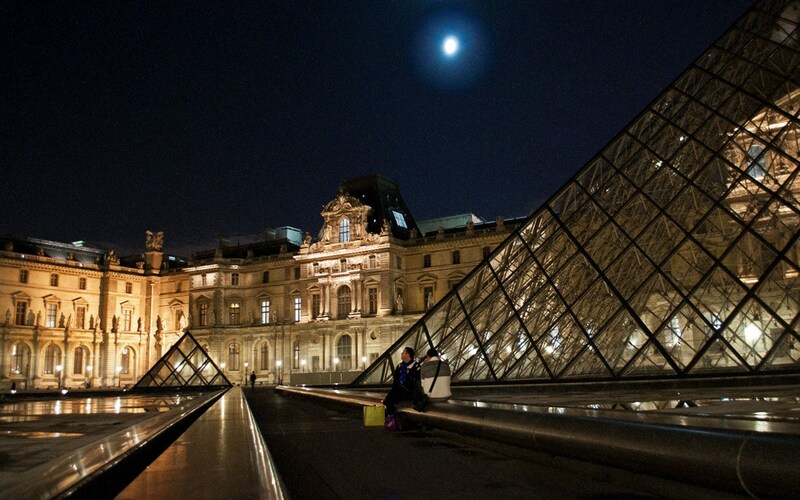 Get a dose of culture after dark in Paris this spring at the Nuit des Musées – Night of the Museums. 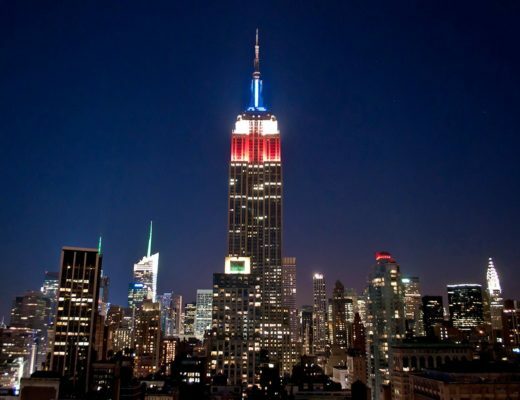 For the last 15 years, the city’s museums have been staying open late into the night on the third Saturday in May (18 May in 2019) as part of a special event taking place across Europe. 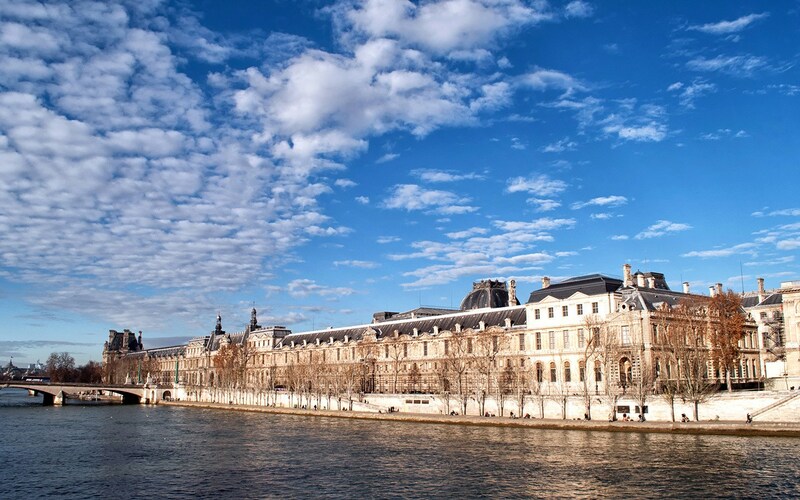 Over 150 Parisian museums and galleries join in each year, including big names like the Louvre, Musée d’Orsay, Pompidou Centre, Grand Palais and Museum of Modern Art. The museums taking part are free to enter for the night, but there are also lots of special events put on for the evening, like film screenings, concerts, performances, tours and kids’ activities. On a warm night it’s a nice way to spend a few hours, strolling between different museums, trying out a few unusual ones and stopping off for food and drinks along the way. 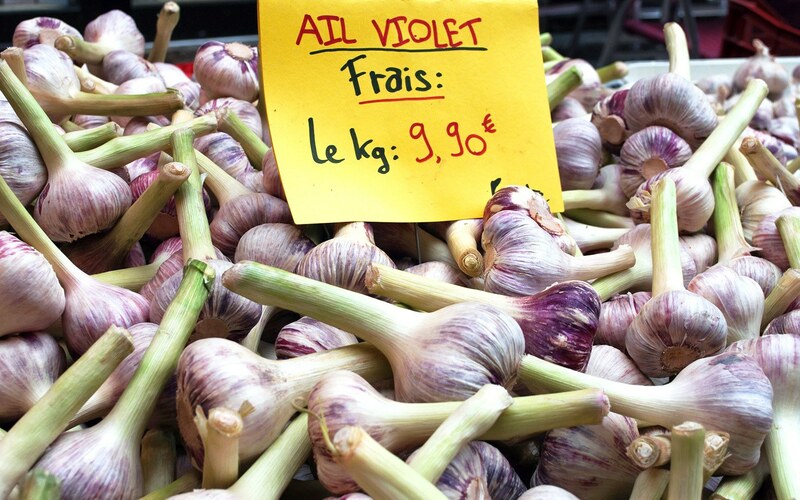 Live your fantasy Parisian local life with a trip to the city’s markets. Spring is the perfect time to visit one of the farmers’ markets for all the new-season fresh produce, with piles of asparagus, artichokes, rhubarb and juicy strawberries. Each neighbourhood has its own market, but some of the best (and most charming) are Marché Bastille, Marché Mouffetard, Marché d’Aligre, Marché des Enfants Rouges – and the market/shopping street hybrid Rue Montorgueil. Or go bargain hunting at a flea market – marché des puces. They’re a real treasure trove where you never know what you’ll come across, from vintage clothes to antiques glassware. The Marché aux Puces de St-Ouen is the city’s best-known, biggest and busiest, with 3000 traders each weekend. It’s broken down into different streets selling different things, but be prepared to bargain hard for a deal. 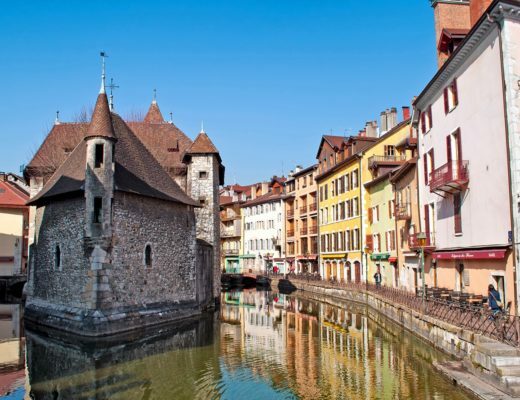 Or try the less touristy Porte de Vanves or Montreuil markets. 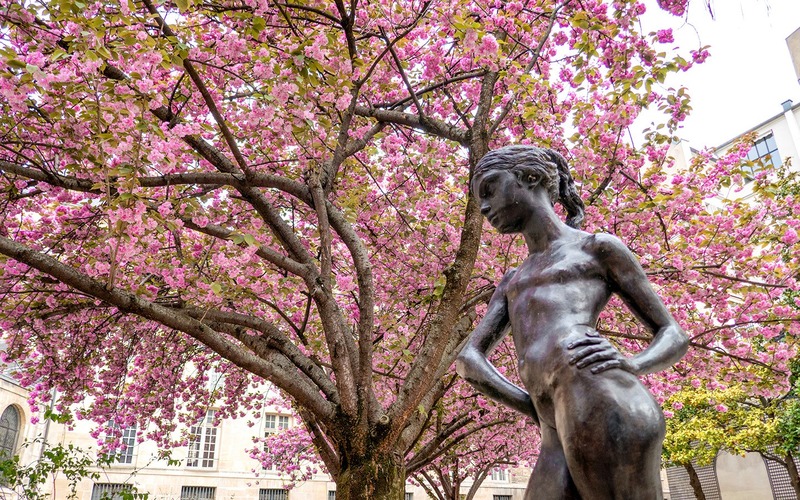 If it’s too nice a day to spend inside a museum, you can still soak up some culture in the sculpture gardens of the Musée Rodin. The building was where Rodin lived and worked, and has been turned into a museum. 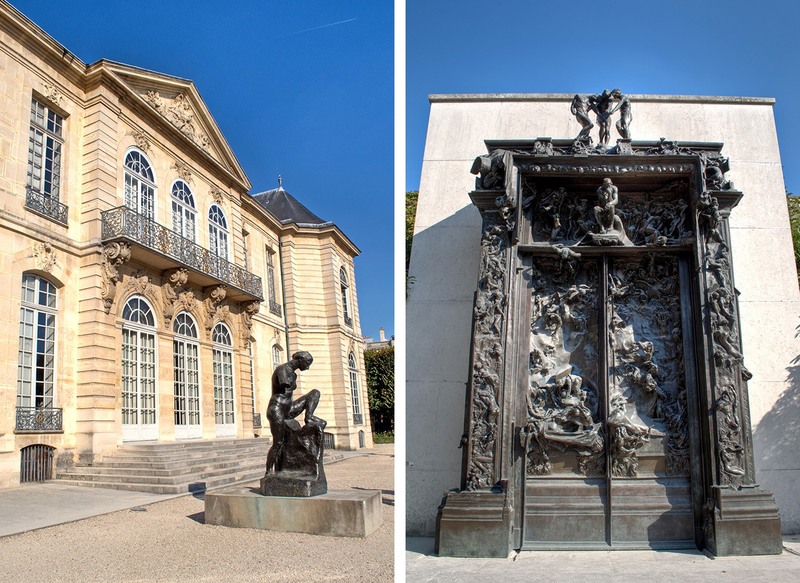 But outside there are over seven acres of gardens featuring some of Rodin’s most famous works like the Thinker and the Gates of Hell, set along plants, flowers and shady trees. It’s one of Paris’ best bargains too as entry to the gardens only costs €5. 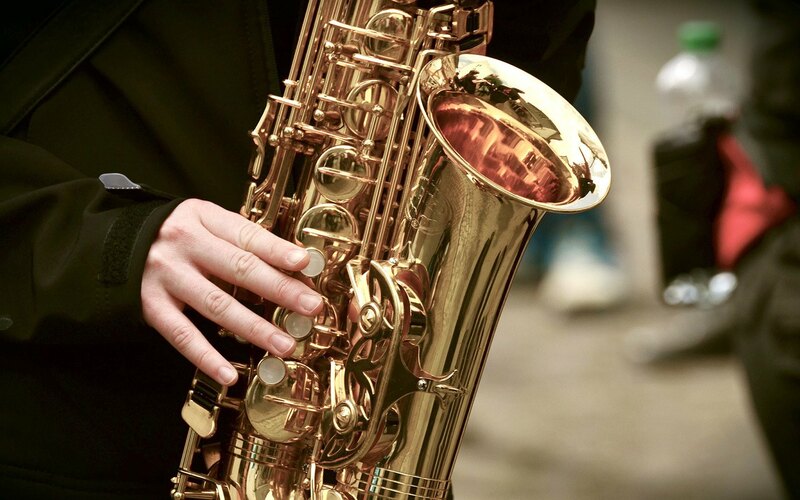 Soak up some live music on a spring afternoon at the annual Festival Jazz à Saint-Germain-des-Prés (16–27 May in 2019). 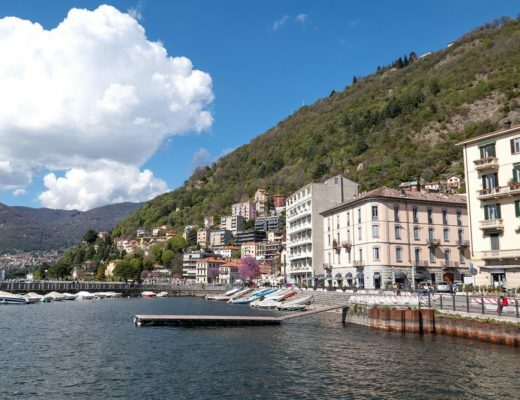 The event’s been held in the area since 2002 and has a mix of free and paid-for shows, with big international names as well as young emerging talent. There are outdoor events in the Place Saint-Germain-des-Prés as well as concerts in lots of interesting venues like the Odéon Theatre, Sorbonne University and Saint-Germain-des-Prés church. Sitting out in the sunshine, drinking a cup of coffee or a glass of rosé and watching the world go by is one of the pleasures of Paris. You’ll find people packing the city’s café terraces at every time of year, but spring is one of the best times to join them. You can’t go 100 metres in Paris without coming across a café, but for peak springtime scenery, head inside Paris’ parks. 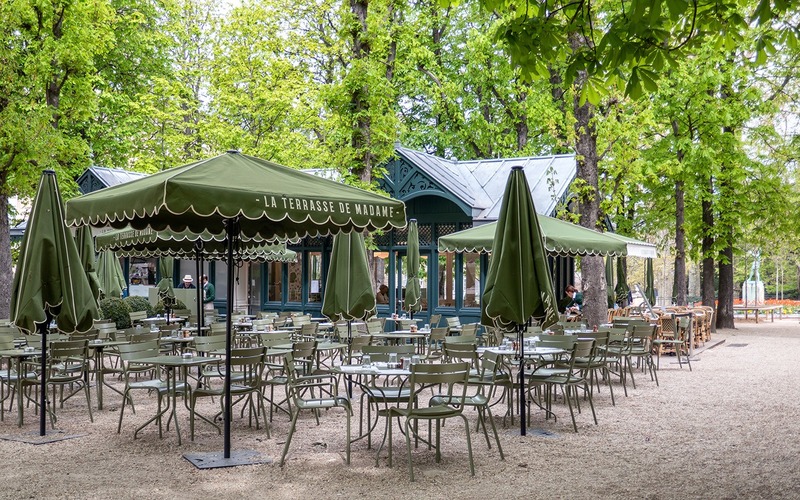 Among the lawns, pathways and boules pitches you’ll find spots like Café Renard in the Tuileries Gardens or La Terrasse de Madame in the Luxembourg Gardens to relax in with a drink or bite to eat. The lavish 17th-century Palace of Versailles is just 12 miles outside of Paris so makes a great day trip from the city. The palace is one of the largest in the world, and was transformed by Louis XIV from a hunting lodge to the French royal family’s primary residence. The interiors drip with gilt, mirrors, marble and carvings. But the palace is also famous for its beautifully landscaped gardens which stretch over almost 2000 acres and include 55 elaborate fountains. From April to October, the fountains come alive to the sounds of Baroque music for the Grandes Eaux Musicales. 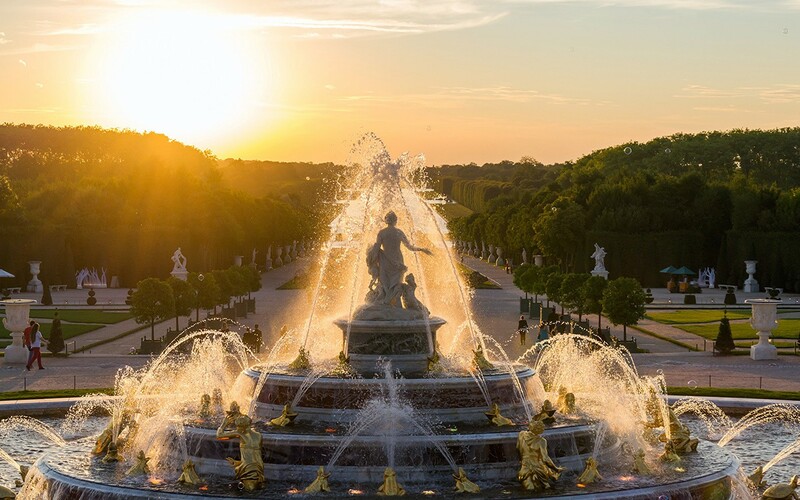 Versailles’ musical fountains show takes place on Saturdays and Sundays as well as on Tuesdays in spring (21 May–25 June in 2019). Pick up a map and follow the route around the gardens, ending up at the Neptune fountain in time for the grand finale. The palace can get really busy, but you can dodge the worst of the queues with a skip-the-line ticket. Perfect. We visited Paris in May and it was ideal. A fabulous picture of Notre Dame! Thanks – would never have imagined it’d be on fire just a few days later! I also went to Paris the week before the fire, and feel very lucky to have seen it one last time as it was. All great suggestions and beautiful photos too – Paris has enough to keep you coming back time and time again doesn’t it? !